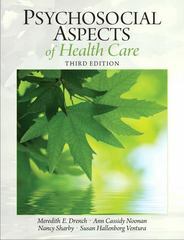 Psychosocial Aspects of Healthcare 3 Edition This timely text offers comprehensive, integrated coverage of psychosocial topics involving clients, families, and other caregivers affected by pathology, impairment, functional limitation, and/or disability. To engage students and promote insight, PSYCHOSOCIAL ASPECTS OF HEALTHCARE, 3/e relies on real-life student journal entries from multiple disciplines. A current, evidence-based, extensive literature review forms the core of the text, connecting theory to practice. Reflective Questions and Case Studies after each chapter stimulate awareness and promote dialogue; relevant clinical examples and tables are presented throughout. This edition’s updates include broader coverage of multicultural issues, spirituality, and chronic conditions; a new chapter on abuse and neglect; thorough coverage of PTSD; improved organization; and a new Online Manual containing extensive readings and resources.